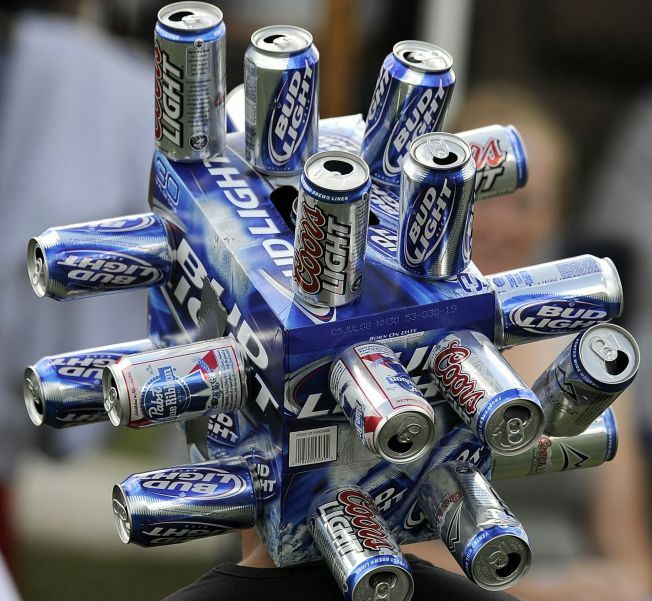 Beer cans are so versatile that fans can fashion headgear from them after emptying them. Ah, the beer can. That chilled receptacle of frosty malted beverage that helps make all the bad things in life go away for a little bit. To think that there was a world that once existed without canned beer, where the only thing that came in cans were vegetables and assorted pig organs. The body shivers at such a prospect. Well, bust out your six-packs and give them a pat on the tab, because yesterday canned beer turned 75 years old! That’s right, the diamond anniversary. New Jersey's Gottfried Krueger Brewing Company churned out the world's first beer can in 1935, stocking select shelves in Richmond, Va., as a market test. The experiment took off and American drinkers haven't looked back since, nowadays choosing cans over bottles for the majority of the 22 gallons of beer they each drink per year, according to the U.S. Census Bureau. And the rest is history. Think of what your life would look like without canned beer. Why, you never would have been able to sneak that six-pack into that matinee of "The Story Of Us." And you never would have passed out in your own sick at that Delta Upsilon party party back in 1986. YOU COULD BE THIN! And that’s a horrible thought. Without canned beer, we’d be deprived of astonishing microbrews such as Milwaukee’s Best, Milwaukee’s Best Light, Milwaukee’s Best Ice, and Milwaukee’s Best: Country Backwash Flavor. Again, tragic. A lot of beer snobs will tell you that all beer should be stored in bottles and consumed from a beer glass (the shape of glass depending, of course, on what kind of beer you’re having, and how annoying of a hipster you are). But I say BAH! to those people. You know what? I prefer my beer out of a can. It’s cold, and refreshing, and it makes me tingly inside. Microbrewers like Oskar Blues are even beginning to see the delight of canned beer, and have begun crafting canned beer that competes with the trappiste ales of the world. Their Old Chub is a delight. So raise a can, blow out a garbage can bonfire, and wish canned beer a happy 75th birthday. LET’S THROW A KEGGER FOR IT.